The United States Trustee Program is part of the Department of Justice. The U.S. Trustee’s office is a regulatory agency of sorts. It selects and regulates bankruptcy trustees (for all Chapters: 7, 12, and 13), investigates bankruptcy fraud, and is charged with filing motions to dismiss for abuse in Chapter 7 cases. South Carolina is part of Region 4, which consists of South Carolina, Virginia, West Virginia, the District of Columbia, and Maryland. You’ll note that North Carolina is conspicuously missing from this lineup. That’s because North Carolina and Alabama are not part of the U.S. Trustee program. They have bankruptcy administrators instead. Why this is, well, that’s another blog post altogether. Suffice it to say it has to do with politics in the 1980s when the U.S. Trustee Program was established. What’s that guy going to ask me? The man or woman from the U.S. Trustee’s office may not ask you anything. In most cases–I’m guessing 60 to 70%–the U.S. Trustee representative will have no questions. If they do have questions, those questions will usually relate to your income and expenses. Under our relatively new bankruptcy law passed in 2005, the U.S. Trustee’s office is charged with taking a more active role in policing Chapter 7 debtors. Put simply, they take a harder look at whether debtors should instead be in Chapter 13 (a payment plan bankruptcy). You should prepare for your hearing by reviewing all of your bankruptcy paperwork. You should know what you listed for your various expenses like food, out-of-pocket medical, and utilities. You signed your bankruptcy petition and schedules under penalty of perjury, and you really need to know what you put down. This doesn’t mean you’ll be peppered with dozens of questions; it just means you need to be prepared for your hearing. If, when reviewing your schedules for your hearing, you find an inaccuracy, let your bankruptcy lawyer know. This happens from time to time, and your schedules can be amended prior to your hearing or we can announce the error on the record and amend the schedules after the hearing. Honest people make mistakes, and everyone in the bankruptcy system knows this. My clients are nervous about their upcoming bankruptcy hearing. They want to know what will happen. I think some of them believe they’ll be treated rudely like crime suspects rather than honest folks upon whom misfortune has fallen. I tell my clients no one will be rude to them at the hearing. The “panel” or “interim trustee” will ask most of the questions. Neither of our Chapter 7 trustees are rude or insulting to debtors. Likewise, the U.S. Trustee attorney will not be rude, either. It’s not Perry Mason, and they are not trying to trip you up with their questions. The key to dealing with the U.S. Trustee’s questions is preparation, and that begins right when you meet your bankruptcy lawyer. Make sure your schedules are accurate. As I tell my clients, I can’t hook a cord up from your brain to mine and download your financial life. You and I need to work together to ensure all of the information on your schedules is accurate. Make sure you know why you put those figures down. Take an active role in your case. You should know (1) what you have, (2) who and what you owe, (3) what you earn, (4) what your expenses are, and (5) the answers to the questions on your Statement of Financial Affairs. When you answer questions posed by either the panel trustee or the U.S. Trustee, be brief, concise, and accurate. No one wants to know your life story, nor do they want evasive, inaccurate, or incomplete answers. Always remember: You are testifying under oath subject to penalty of perjury. But also keep in mind that this isn’t the Spanish Inquisition, either. For more information on the U.S. Trustee Program, you can check out its website here. Disclaimer: My post-2005 experience with the U.S. Trustee Program is limited to dealing with the attorneys in the Columbia, South Carolina office of the U.S. Trustee Program in Region 4. I have stated that dealing with the U.S. Trustee’s office “isn’t the Spanish Inquisition.” Please note that I make no warranties, express or implied, that dealing with the U.S. Trustee in other states or regions will not be like the Spanish Inquisition. 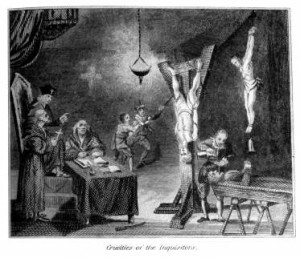 Dealing with other offices could also resemble other inquisitions such as the Portuguese Inquisition, the Medieval Inquisition, or the Roman Inquisition. However, I kind of doubt it. Postscript: For those of you too young to have figured out where the line, “Nobody Expects the Spanish Inquisition!,” is from, it’s from Monty Python’s Flying Circus, Series 2, Episode 2 which premiered on September 22, 1970 as a parody of the real Spanish Inquisition. The series of skits (click here to see one) started with someone complaining about being questioned like it was the Spanish Inquisition. Three Cardinals would then appear declaring, “Nobody expects the Spanish Inquisition!” They would then attempt to torture the person in some comedic, ineffective way. Yet another postscript: The irony of putting the federal government in charge of making sure American consumers do some “good, old-fashioned belt tightening” in hopes that more of them file Chapter 13 is not lost on me. It’s like putting Ozzy Osbourne in charge of the local rehab clinic. To be sure, most of the attorneys who work at the U.S. Trustee’s offices nationwide are likely a fiscally conservative bunch. But their employer, good ole Uncle Sam, spends money like a drunken rock star. As of today’s date, our national debt is $14,176,720,184,898. (That’s over 14 trillion dollars!) And unlike the federal government, consumers can’t just sell bonds to the Chinese to make ends meet. PreviousPrevious post:Bankruptcy and Your 401(k) LoanNextNext post:Chapter 13 Bankruptcy: Should You Buy a Car Prior to Filing? Where is the Bankruptcy Court in Charleston? What Should I Wear to My Bankruptcy Hearing? Oh, if only your second postscript were not so true!